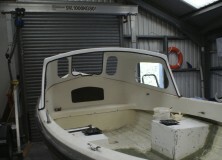 Arran Boat Sales 16' Fishing Boats for Sale Built in Scotland. The Arran 16 has been a familiar sight in harbours and marinas all around the UK for over the past 30years. Inshore fishermen who haul crab and lobster pots for a living, find the stability of the boat hard to beat. 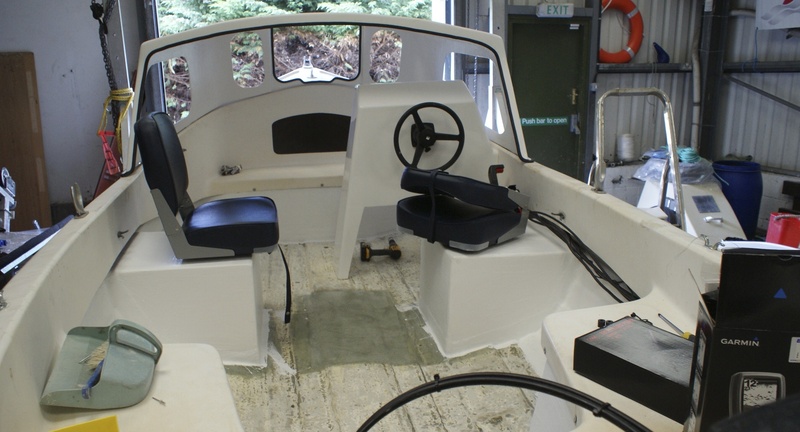 The open deck space and economical daily running costs of the Arran 16 make it the ideal small workboat. 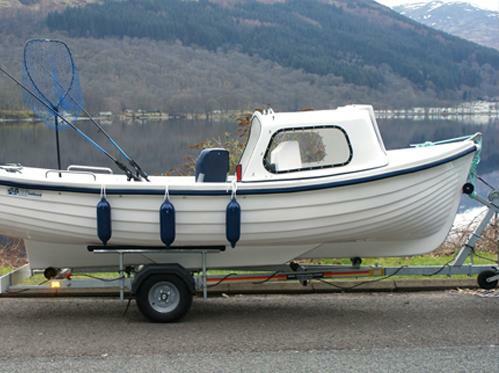 Its strength and stability have also made the Arran a firm favorite with hire boat operators. Thousands of visitors to the Lake District and South Coast have hired them to take to the water. 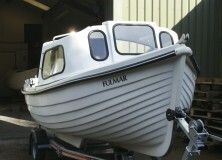 At 16ft in length it’s a safe but very manageable size of boat and can be easily towed behind most family cars. It has an excellent safety record and with a CE Cat “C” rating for 4 persons there is room for the family. The boats have spread far and wide with time and can also be found in Ireland, Denmark, Holland, Germany, France and Malta. I have even received pictures of an Arran that somehow made its way to Africa. 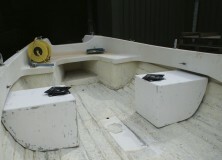 The Removable cuddy is attached to the boat by 5 strong snap latches, again stainless steel. Release these and remove the cuddy, and you have a large open fishing boat... feels like 2 boats for the price of 1! 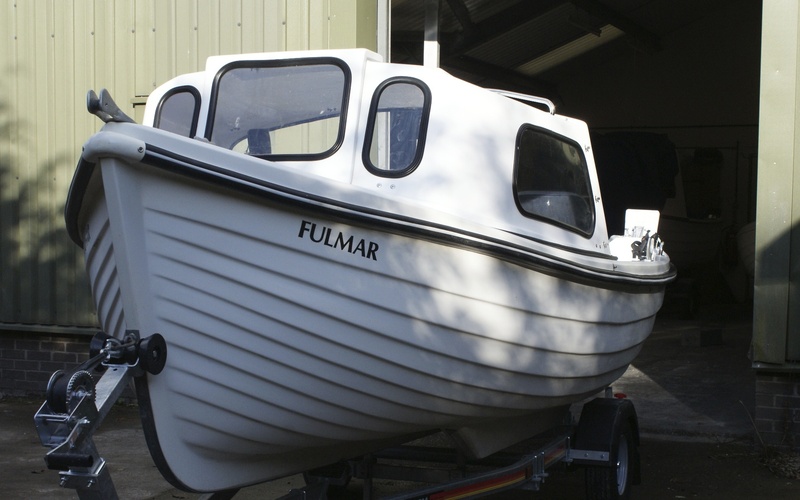 Basically small boats fall into two categories: planning hulled and displacement hulled boats (the latter like the Arran 16). 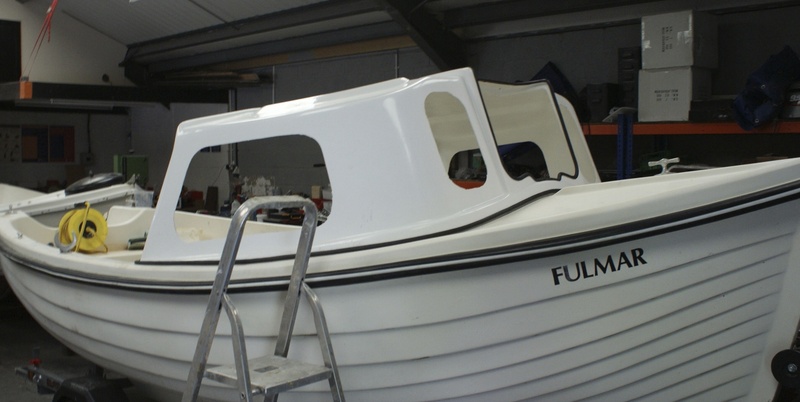 Planning hulled boats need much larger outboard engines typically 50hp upwards to lift them up out of the water onto the plane. This allows them to move faster across and on top of the surface of the water. The running costs of an Arran 16 are very low due to the small H.P. (horse power) engines required to push a displacement hulled boat along, and through, the water. 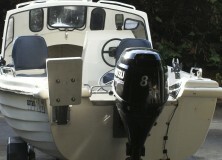 Displacement hulled boats only require small outboard engines 4 -15hp, as in the case of an Arran 16. This is because it pushes its way through the water and water takes time to move out of the way. The max hull speed is related to the length of the boats waterline. Realistically it simply won’t go any faster regardless of the size of engine you put on it. Most people only have a limited budget to spend on a boat. 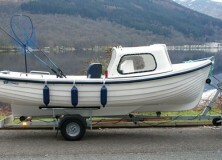 You can buy a brand new Arran 16 fishing package from me, cheaper than many of the planning hulled boats are secondhand. 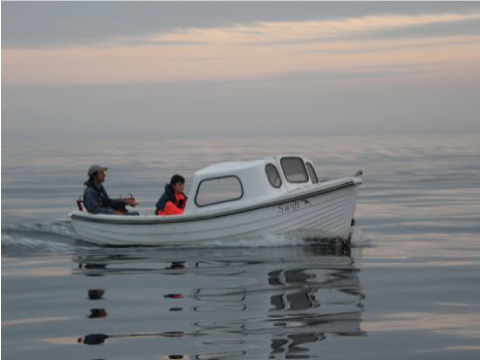 Most of our freshwater lakes, lochs and rivers have speed limits on them in any case, thus making the Arran the ideal fishing or pleasure boat for inland waterways. The Arran 16 only ever takes a long-shaft engine up to a maximum of 15hp. These are cheaper to buy initially, cheaper to service and maintain, but best of all the fuel economy on the new 4 stroke engines is staggering. 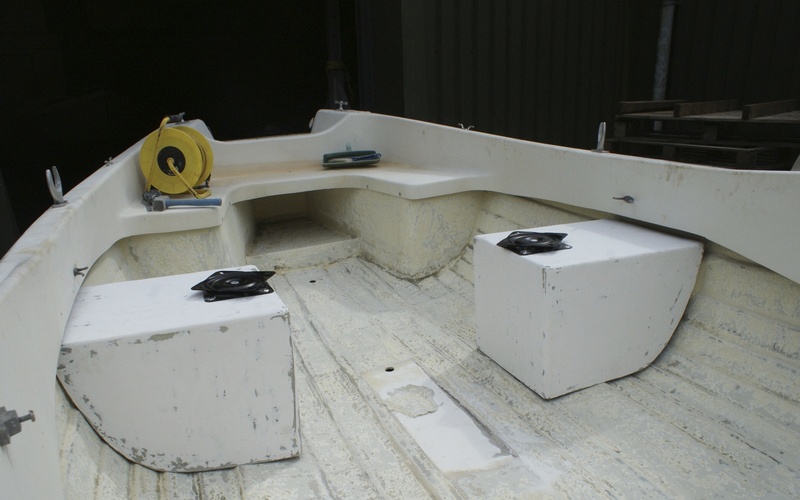 The boat has been in production for over 35 years with the outer hull shape changing little in that time. It has a well proven history right across Europe and an excellent safety record. 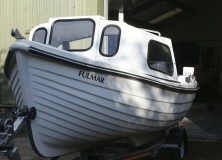 It will sit flat on the ground or on a dry mooring without tipping over. 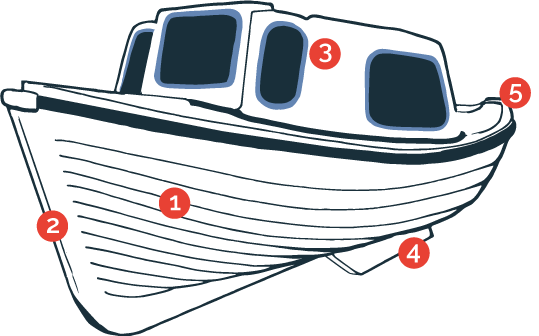 The boats category “C” class also makes it very safe to use on large inland waters, like Loch Lomond, as well as inshore. The beaufort scale is a wind/force scale which relates wind speed to observed conditions. Force 6 on the beaufort scale (winds of 25-31mph) produces cat ”C” conditions. This is where long waves begin to form, white foam crests are very frequent and some airborne spray is present. The Arran 16 is “CE” rated for 4 persons under these conditions. The category C rating the boat currently holds is explained below. 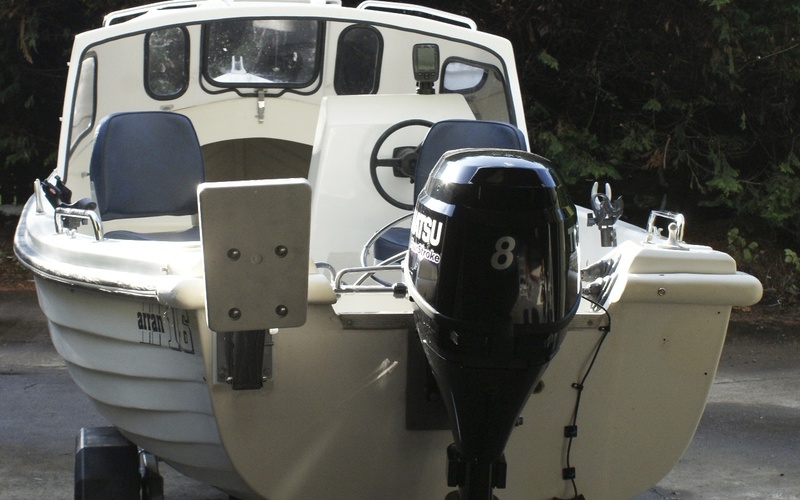 The Recreational small craft directive divides boats into four main categories "A", "B", "C" and "D", using significant wave height as the key element to distinguish between them. It gives a general description of the areas where such wave height is common. The term significant wave height means the average height of the highest 1/3 of the waves over a given period. In these conditions waves of over double that height may occasionally be experienced. It is the crest to trough height that is normally used in weather reports. Where the craft is designed for significant (mean) wave heights exceeding 4m and described as "OCEAN"
Where the craft is designed for significant (mean) wave heights of up to and including 4m described as "OFFSHORE"
Where the craft is designed for significant (mean) wave height up to and including 2m as described "INSHORE". The Arran 16 Displacement Hulled Boat falls under this category. 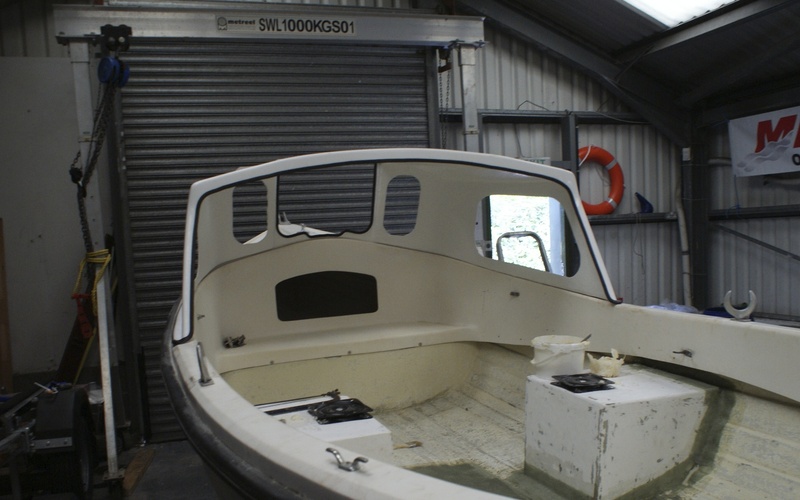 Where the craft is designed for significant (mean) wave height up to and including 0.5m described as "SHELTERED WATERS"
Over the past 10 years I have sold an increasing number of boats to fishermen who troll the large English lakes and Scottish lochs for big Pike, Perch and Char. The current British Record Ferox Trout of 32lb 11oz was caught from an Arran 16. 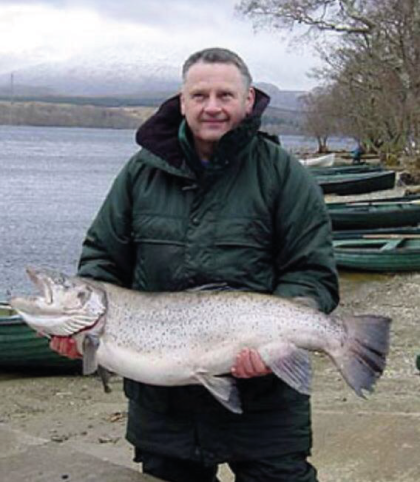 Brian Rutland holds the British Record for catching this superb 32lb 11oz trout on Loch Awe on opening day 15th March 2002. Brian made his record-breaking catch in an Arran 16, and bought his own Arran Boat in 2015. 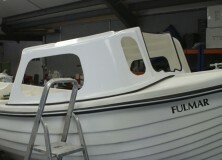 The Arran 16 is a very versatile small fishing boat. The fitted cuddy on the Arran 16 is fully removable in seconds, by unclipping four clips, and you then have an open boat, fantastic for summer fishing or cruising. 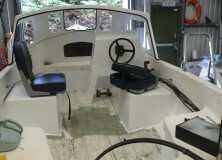 With the cuddy removed you have even more open deck space and this allows two fly fishermen, for example, to sit and cast at either end of the boat safely. 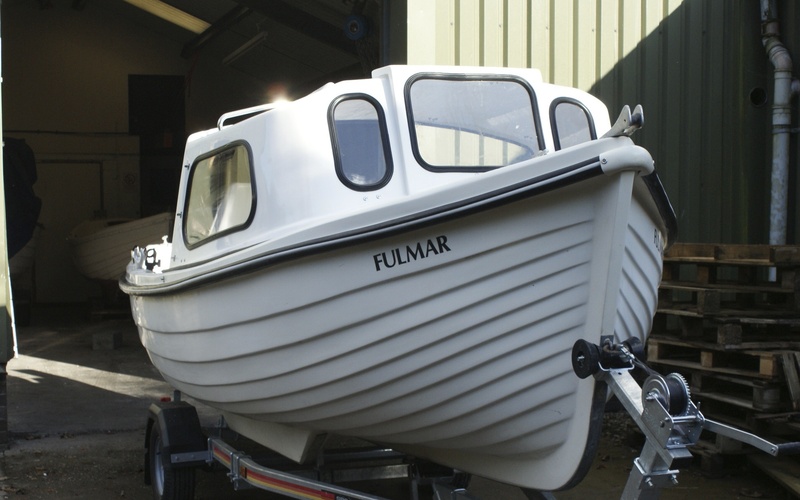 As part of our service you can have delivered with your boat almost anything you can think of. We can supply you with all the recommended gear, including anchor chain, rope, fire extinguisher, oars, perry buoy, first aid kit, flares, VHF radio and life jackets for everyone onboard. This is not a full list by any means but is a good sensible start. Let me know what you want I might just have it secondhand. Please see our Price List for further details on the chandlery and components we can supply you with.